Losing teeth is a sad exercise. It is a part of your body you have had for a long time, marking the end of a long and fruitful relationship between you and the tooth. When the losses start mounting up, it may be time to turn to dentures. University Dental Family Dentistry and Orthodontics in San Diego specializes in dentures, offering both partial dentures and complete dentures. Dentures are removable replacements for missing teeth and surrounding gum tissue. Dentures are made to fit conveniently and comfortably in your mouth based on impressions made of your jaw, as well as a series of measurements. Dentures allow those with a series of missing teeth to eat without restriction and have a full and healthy smile. What are the Kinds of Dentures Available? 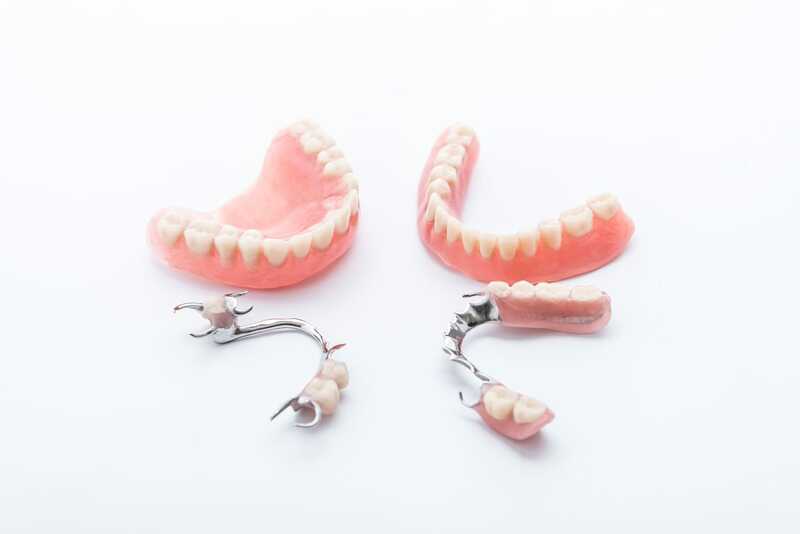 There are primarily two different kinds of dentures, partial dentures and complete dentures. Complete dentures are used to replace a full set of teeth. Usually, this means that the patient needs to have some teeth removed and must wait for the gum tissue to heal before dentures can be used. Partial dentures are used when there are one or more natural teeth remaining in the upper jaw or lower jaw. These removable replacement teeth are attached to a gum-colored plastic base that has internal attachments for a natural looking fit. What is the Difference Between Temporary and Permanent Dentures? What is Eating With Dentures Like? Are There Eating Restrictions? Like anything new, eating with dentures will take some getting used to and may be uncomfortable at first. We suggest starting with soft food cut into tiny pieces, the eating version of “walking before you run”. Make sure to chew slowly and use both sides of your mouth until you get used to the dentures. Over time, you can add more variety to your diet, although you should remain cautious with hard foods, sticky foods, bones, shells and hot food. As a rule, with dentures you should avoid chewing gum or using toothpicks. If you are missing close to all of your teeth, dentures may be the way to go. Get back to eating what you want when you want and smiling with confidence with dentures and partial dentures at University Dental. We house denture experts who can get you dentures that fit and look perfectly. We also offer All-On-4 dental implants, another more permanent solution for missing teeth. For more information, give us a call at (619) 582-4224.